One of my guilty home fantasies is to have a fireplace. A big, warm hearth to gather around when the San Francisco fog rolls in—and also so I can burn that perennial almond wood from Whole Foods that always looks so good. But as a city dweller, this is far fetched. Luckily, with the opening of TBD in SOMA, I think I might have found a dream come true. 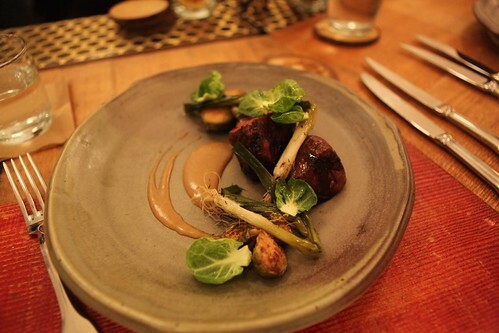 TBD is the second restaurant project by the young, energetic, and enterprising team that opened the seasonally focused AQ restaurant—which incidentally is right next door to TBD in SOMA. And if AQ is affordable fine dining, owner Matt Semmelhack and chef Mark Liberman have now opened an even more casual environment in TBD, a place where guests can find hearty seasonal meats and other grilled delicacies, a communal place to gather around an urban hearth, and easy, culinary-style cocktails. Yes, this is where I’m going to get my fireplace fix. It’s the perfect place for when you want to get a bit, well, lodge-y. 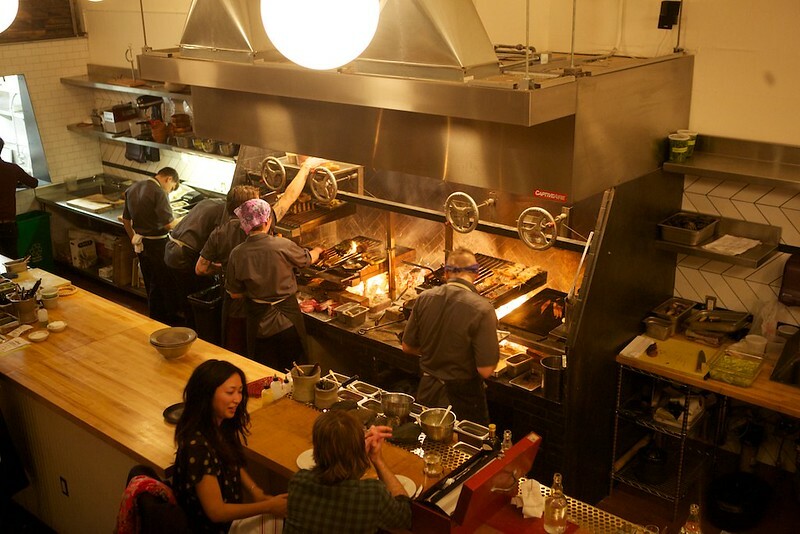 The dominant feature in the narrow space is a dramatic open grill, where on open flames cooks grill nice slices of locally source filets and farmers-market-fresh vegetables. 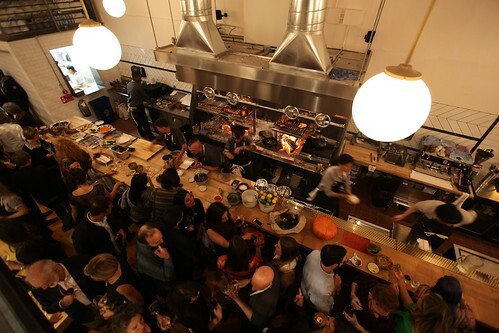 Patrons have a choice of sitting at the bar in front of the open oven or at dining tables either on the ground floor on a loft level looking down into the open kitchen. And to Tim, that meant putting a fresh spotlight on the ever more popular low-ABV cocktails, drinks that rely on wines, beers, and bitters instead of more traditional hard liquors. Tim calls these drinks "Loopholes." Isn't that cute? 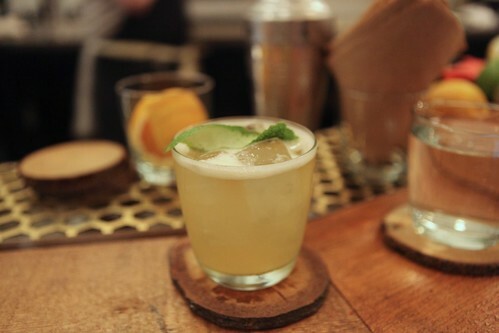 Tim first became interested in low-ABV cocktails when he was designing the bar menu at AQ, before it got its liquor license. But, at TBD, the reason for Loopholes is not that the spot had trouble getting the highly coveted liquor license, says Zohn. Rather, TBD is the place to find a fresh look at how great tasting drinks can be made with these sometimes denigrated ingredients. Plus, they go pretty great with food. I tried of few of these cocktails. The cleverly named Nogroni (opposed to the Negroni because this one has no gin, swapping out the spirit for bitters). Like a Negroni, it's bright and rich, but a little more spicy. Something not on the menu, but a drink I highly recommend if you catch Tim: a Beergarita! It's sparkling, bright, dry, a little savory (from the wheat), and refreshing! 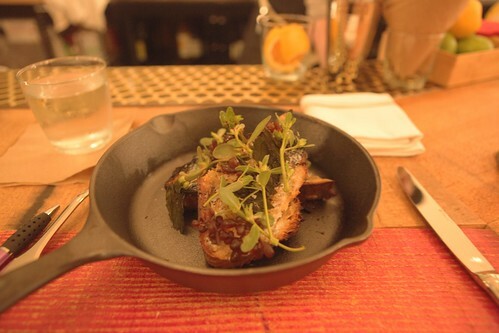 In addition to the drinks, TBD boasts a delightful menu with small, medium, and large share plates focusing on grilled items. 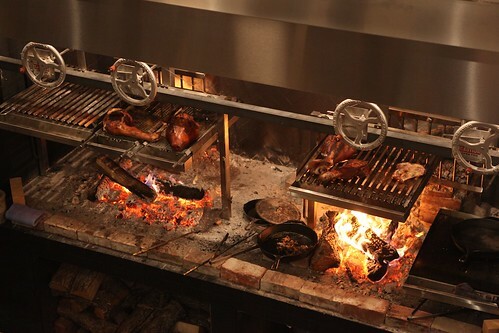 The menu is divided into several categories: raw, smoked, hearth and embers, grill, plancha, and sweet. 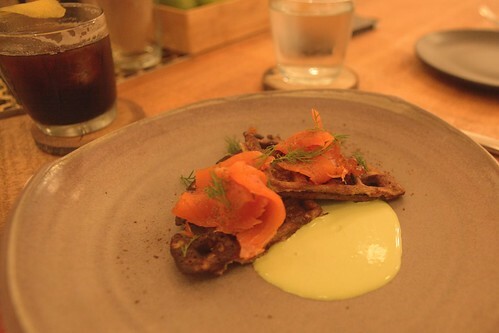 This dish of cured wild salmon, rye waffle, and dill was particularly delicious. The waffle was satisfyingly crunchy and a little chewy, perfectly sweet with the rich flakes of fish. 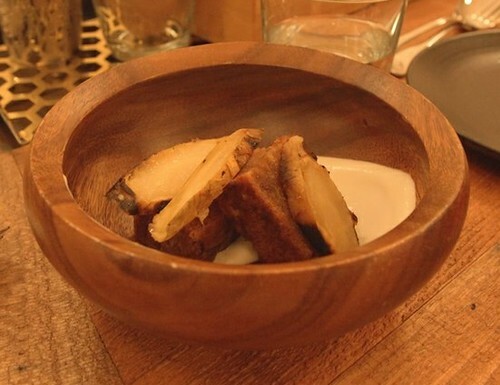 The bread, butter, and seaweed offers a really nice vegetarian small plate. The butter is bright and fresh and the seaweed is crunchy and briny. I also ordered the aged beef sirloin, which was a dense, rich cut cooked perfectly pink. Cooked on this beautiful grill, no doubt! 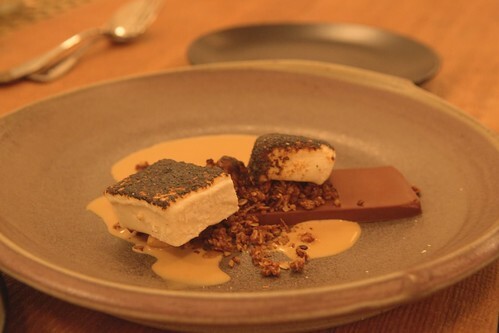 And finished with "smores"—satisfyingly smokey and with crunchy chicory! And super moist dutch oven cake!